October 25, 2012 by iCepts Technology Group, Inc.
With Microsoft Dynamics NAV 2013 you can make more users more productive, simplify day-to-day functions and processes, and you will decrease operating expenses while improving cash flow. 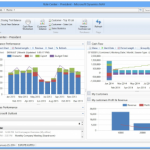 RoleTailored User Experience Enhancements: expand RoleTailored functionality in Microsoft Dynamics NAV for users through improved charting capabilities and other productivity enhancements. • End-User Charting: Take advantage of unique charting and visualization capabilities in Microsoft Dynamics NAV 2013 to help users see and understand data from across your business, and then to take prompt, informed action. Flexible, configurable chart types and charting capabilities give users a simple way to drill down into details from a chart or visualization, fostering improved analysis and better control. With new configuration and data aggregation tools and more chart types available in the RoleTailored client, it’s possible to add a chart to individual Role Centers or other areas within the application, change the chart definition, show it in three dimensions, flip its axis, and print it. From any list place, you can change the view of the data to display it in a chart format. And you can add a FactBox that contains a chart, which can be customized. • Grouping on Pages: New functionality enables display of content in tabular format. • Query: A “data pump” capability improves impromptu reporting through improved access to data in Microsoft Dynamics NAV 2013 or, via web services, to data in other applications such as Microsoft Excel and PowerPivot.